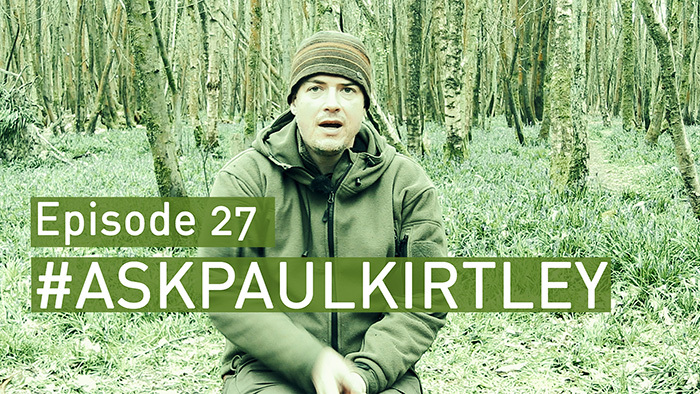 In this episode of #AskPaulKirtley I answer questions about canvas vs synthetic fabrics, aluminium pot safety, clothing which is tough enough for the woods, dealing with fear when camping alone, whether to use tents or tarps in blackfly season and what’s my opinion on survival tins and foil space blankets. Hey there, great stuff, thank you so much for this series! I have something to add to the topic of wolves. Living in a wolfregion myself i don’t think they are much of a problem and don’t like the emotions involved in wolfdiscussions. And as you said hearing a wolf when you sit by a campfire is an incredible moment. Thanks for your comments. In particular thanks for your link to the report on the Chignik Lake incident. I was not aware of this and stand corrected. Indeed, it is thankfully very, very rare. Wolves remain at much more risk from humans than humans do from wolves. I replaced my orange survival bag with a one made from the same material that is used for ‘space blankets’ it is still Orange on the outside and I think a good alternative if not so versatile, so I’m more likely to have it with me as it is much lighter and smaller than the traditional orange bag. If I have a ‘wobbly’ moment when I’m on my own in the woods at night I remind myself that I’m almost certainly the scariest thing in the woods with my knife and axe to hand! Not that I’m advocating violence of any kind of course, but it can be a comforting thought. Is the orange/silver bag you have one that is rolled into a small cylinder when new? Yup, 8cm x 6cm diameter and 107g inc. tiny suff-sack. I got mine from backpackinglight.co.uk Bob (at Backpacking Light) says you can pack them up again into the stuff-sack but I must admit I haven’t actually done this yet! P.S. There is a zoo not far from one of my bivvy- sites. There is something about hearing a Tiger in the dark that pushes your primal fear button! As an example of not being found: for three summers I slept in a tent (1 year) and hammock (2 years) in the woods outside Östersund in Sweden (I was there due to seasonal work, so it was about 70 nights each season). The area I used most with the hammock was crisscrossed with jogging paths, and I was seldom more than 20 m from a path. During all those nights only once did a late dog-walker leave the paths, and once more an very early jogger passed my camp. I can add that the Hennesey style hammocks is a nice alternative in the boreal woods during insect season. Quick and comfortable, and you both can see the woods and are protected from the ,insects. I carry a tin, but I have different items in it. I carry coins for the parking meter, paper money in case I have to take a taxi, mini sewing kit, a couple plasters, etc. Most emergencies are covered and I just have to pick up the one package before hopping on the train or in the car. I definitely feel more fear on the tube in London than in the woods, even in just a tent in the Kalahari there was less to fear than commuting to work. I often wonder why I came back. I was especially interested on the conquering fear stuff. I am fortunate in that I have a couple of like minded friends to go wild camping with but I really want to do some solo camping and it’s the whole fear of being out in the dark on your own that’s holding me back. Having listened to your thoughts and also other commenters and of course the original question, I’ve actually found it quite comforting to know that other people feel/have felt the same way. When I watch a lot of survival/bushcraft/camping stuff it always seems like everyone involved has no problem being out wild camping alone , as if it isn’t even an issue. Now that I know I’m not alone in feeling like this and that other people have felt this way and got over it, I reckon it’s time to just man up and become the scariest thing in my local woods. I think it was this episode that talked about netting for bugs? The SnugPak sleeping bags also have netting built in to zip over the face part of the hood. Very handy, but not as much space as a full net. this might be considered a lateral suggestion, but check what you are taking in as input. i.e the news, soaps and dramas consist mostly of Murder and Mayhem. As an experiment our family once tried to identify how many stories we had come across that did not have “Bad Guys” we just about scraped up 20. There was about 100 years of experience between us and we figured we had heard about 5000 – 1000 stories. Conversely we had met somewhere between 5000 and 10000 real people but had trouble scraping together 20 real “bad guys”. An unconfirmed anecdote I heard is…… that after watching Jaws there were Adults who were afraid to go into swimming pools.